Moments before Oculus Story Studio's new virtual reality short Lost reached its satisfying climax, I found myself in a compromised position. Sequestered in a private demo booth, I was involuntarily crouched down, covering my head in a defensive position and, I should add, squealing with delight. Lost, the first computer-animated work to come from Oculus VR's new film-innovation lab, is unlike any form of interactive entertainment I've ever experienced. And it succeeds in one very crucial respect: It's endearing. "I want to create emotions that are very appealing," says Story Studio's Supervising Technical Director Max Planck. "I want you to come out of virtual reality and have a smile. Or [experience] something very touching emotionally, just like Pixar films do." Max Planck, Story Studio's Supervising Technical Director, at the Sundance Film Festival. That Pixar DNA is something Planck is very upfront about. And with good reason, too, as he and other Story Studio staffers, like Lead Creative Director Saschka Unseld and Animation Supervisor Ramiro Lopez Dau, are former employees of the Disney-owned animation house. Others on the small team of 10 hail from visual effects house Industrial Light and Magic, as well as positions within the gaming industry. "We have to come up with a lot of creatively constrained solutions to how to tell a story. ... So we like people who are comfortable in a difficult, computer-related atmosphere; who love games and film and theatre," Planck says of the studio's wide range of creative talent. "We have to come up with a lot of creatively constrained solutions to how to tell a story." The combination of that pedigreed know-how is evident in Lost's polish. The roughly four-minute short, which takes place in a moonlit forest, is intelligently designed so as to ease viewers into the virtual realm and guide them through the experience without the navigation mechanisms ever showing. And it's accomplished using a combination of Oculus VR's head-tracking tech, audio cues and discreet visual guides -- in this case, the firefly that initially greets you in Lost. "You might not have known, but the experience waited for you to be ready for the titles to begin," explains Planck. "There [are] two moments of triggers. It's waiting for you to be comfortable with the forest. And then also when that beeping is happening, it's waiting for you to discover that moment." But Lost's initial user experience wasn't always as seamless as it is now. Originally, the short incorporated several such "gaze triggers" that Planck says held up the pace and made it feel more like a game. "It felt like I need to progress the story by finding where I need to look," he says. "And we didn't like that. We wanted it to feel like you didn't know those moments. They just kind of happen. You felt like you were there and the story was tailored to you in a way you didn't know." Planck's team also experimented with the inclusion of "teleports" in Lost. Essentially, these were moments where the viewer would be suddenly transported from one semi-fixed location to another. But the effect was ultimately too disorienting and required a "lull in the story" to allow the viewer to readjust; another element that would kill pacing. "It's like an immersive theatre. It's a stage," Planck says of the current Lost viewer experience. "It's like an immersive theatre. It's a stage," Planck says of the current Lost viewer experience. "We put you there and we like that. We may come back to teleports in the future. But for now, I think they're too distracting." The removal of teleports from Lost means much of the action, or story, unfolds at a set distance in front of the viewer. Yes, there are moments when characters and bits of the environment come close to the viewer -- a concept Planck calls "proximity enjoyment" -- but these are used sparingly. And that's entirely intentional. "We found that when you bring objects really close, especially appealing objects, it's really fun," he says. "You can look around them. They feel close. You feel present with them." 'Henry' or 'Codename: Kabloom,' Story Studio's upcoming comedic short. That's not to say future Story Studio shorts, of which five are planned for this year, won't place the viewer consistently in the midst of the action. 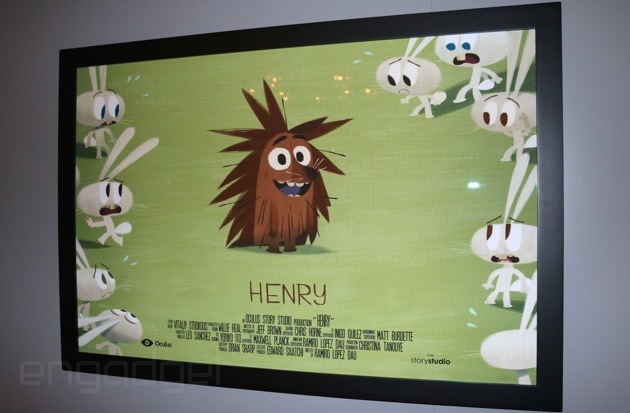 Planck says it's possible the studio's next effort, Henry or Codename: Kabloom, will incorporate that feeling of closeness. It's all a matter of getting people acquainted with VR. "Right now, I think people new to virtual reality need that distance. Otherwise, it feels like you're too much in my personal space. This feels too real. I think we'll get used to it and we'll want more," he says. "Right now, I think people new to virtual reality need that distance. Otherwise, it feels like you're too much in my personal space. This feels too real. I think we'll get used to it and we'll want more." 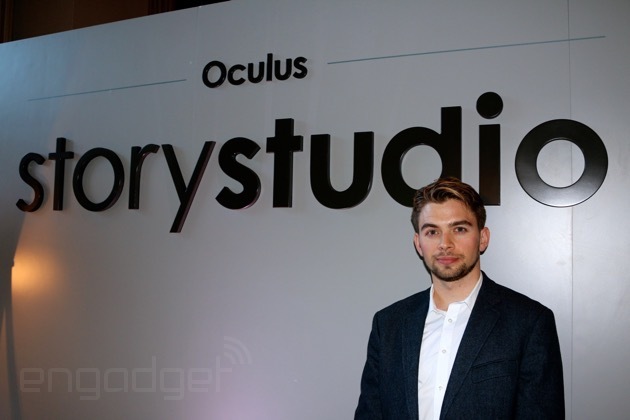 Without a retail version of the Oculus Rift to feed content to, the Story Studio staff is instead tasked with three distinct goals: creating VR art, figuring out the storytelling requirements of the medium and evangelizing the platform. To that end, Planck says the small studio's approach to the greater entertainment industry at large is one of openness and information exchange. "I'm of the mind that here's our project files. Here's our code. Here's our assets. Here's how we did it down to the nuts. That's the point. We're trying to demystify [VR]," he says. Lost is the first step in that outreach, as it stands as proof of the medium's enticing potential and current pitfalls. By exhibiting the short at Sundance, Story Studio hopes to attract the interest of other creatives and filmmakers. It's a release plan Planck says will be repeated with the five other shorts slated for this year. Though he stresses that Story Studio's emphasis is on crafting a "good short" and not on hitting festival deadlines, like rushing something to debut at the Tribeca Film Festival. 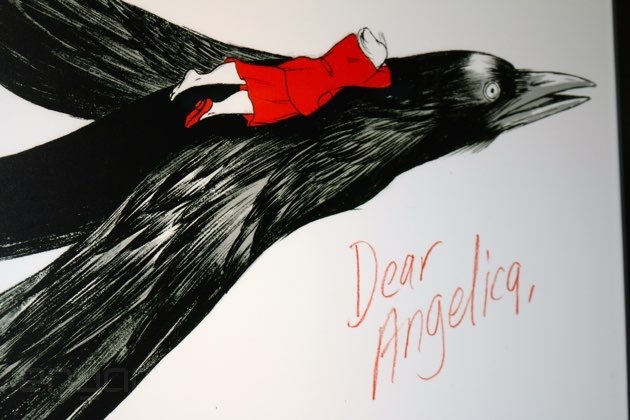 A promo poster for 'Dear Angelica,' Story Studio's surrealistic virtual reality short. If development goes uninterrupted, Planck says Henry or Codename: Kabloom could debut sometime in the next four months. Beyond that, the studio has formally announced two more shorts: the action-heavy Bullfighter and surrealistic Dear Angelica. An additional two unnamed shorts are also deep in development, though Story Studio is not yet ready to disclose further details. What is certain is that for each successive effort, Planck aims to address a technical challenge and further innovate the medium, much like Pixar does. That means Story Studio's future shorts could include successfully implemented gaze triggers, teleports or even "passage of time in virtual reality." Ultimately, Planck says Story Studio is still just finding its way in the new medium, as much of the work is trial and error. "We're still learning. So we'll be like, 'This is great! We want to do this.' Then we get it into virtual reality, and we're like, 'Nope, this doesn't work.' It works as a great film, but it doesn't work in virtual reality."